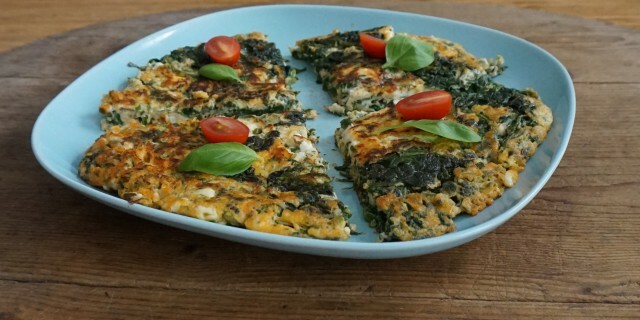 This Spinach Feta Omelette with fresh basil is super delicious and very quick to prepare. It’s great for breakfast or lunch and even as a light dinner with a green salad on the side. I rarely eat eggs at home but I just spend some time in Brittany, France, and eggs were on the menu everywhere! I for inspired to eat more eggs at home. To cook the omelette, I used a method that is often used in the Provence, which involves turning your omelette around instead of folding it in half. Both sides become nicely browned this way making the omelette even more tasty. Omelettes are such a great way to create a super quick and tasty meal. The best part is that you can add any ingredients you like. Feta cheese, spinach and basil are such a great combination. To serve, add some fresh baby tomatoes and a few fresh basil leaves. It’s also great with a very simple green salad. Break the eggs in a medium-sized bowl. Season with freshly crushed black pepper and sea salt. Use a fork to gently mix the eggs. Make sure the mixture does not become frothy. Mix the tomato puree with the water. Add the watered down tomato puree, garlic, chopped herbs and crumbled feta cheese to the egg mixture. Gently mix all of the ingredients in. Sautee the spinach in the water in a medium-sized sauce pan until wilted. Drain and set aside. Heat the olive oil in a heavy medium-sized sauce pan. Add the drained spinach and fry until the spinach is ‘dry’. Bring the saucepan up to a high heat and then quickly pour the egg mixture into the center of the pan. Use a wooden spoon or spatula to gently push the mixture portions toward the centre of the sauce pan. When it starts to turn golden brown underneath, turn it around quickly, by using the lid of the pan and turning the pan upside down. Place the turned around omelette back into the sauce pan and cook until the bottom is golden brown. Serve with fresh basil leaves and sliced baby tomatoes.